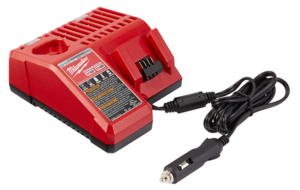 Up until now if you wanted to charge your Milwaukee M18 batteries on the go, you had to purchase a M18 only vehicle charger. 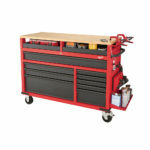 If you wanted to charge your Milwaukee M12 batteries on the go, you had to purchase a M12 only vehicle charger. 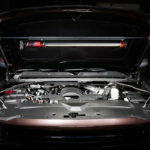 But what if you have M12 and M18 batteries you want to charge on the go while driving? 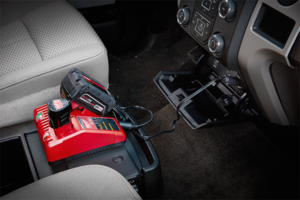 Milwaukee didn’t offer a combination charger for use in vehicles before but that all changes today as they now have a dual voltage Milwaukee M18 M12 Vehicle charger that charges M18 and M12 batteries on the go with a 12V DC cigarette lighter plug in your vehicle. With Milwaukee REDLINK Intelligence, this charger communicates directly with M18 and M12 battery packs to monitor cell voltage, temperature, and charge status to optimize the performance and overall life of the packs. 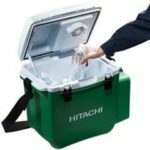 As an added level of communication, the charger has protective electronics that monitor the voltage of the user’s car battery. The charger will automatically shut down to prevent excessive discharge if the vehicle battery voltage dips too low. It’s basically a vehicle charger version of their “regular” dual voltage M18 M12 charger that’s bundled with most M18 kits which means it’s not like their newest and greatest Rapid Charger which charges batteries faster than normal. It also wont charge two batteries at a time as these chargers are sequential chargers, meaning the battery placed first charges while the second battery waits it’s turn. 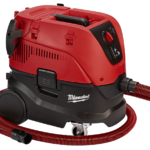 The new Milwaukee M18 M12 Vehicle charger was announced today and it will be available soon just around the corner in mid May 2017 with a retail price of $99.